The majority of stillbirths and maternal and neonatal deaths are preventable, and yet every year an estimated 303,000 mothers die during childbirth, 2.7 million babies die within the first 28 days of life and 2.6 million stillbirths occur. Particularly in countries with insufficient health information systems, many of these deaths are not recorded or reviewed. Access to accurate data on the incidence and causes of mortality is crucial for developing life-saving interventions. 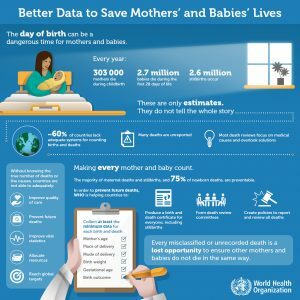 The World Health Organization (WHO) recently released three publications designed to help countries improve data collection on maternal and neonatal deaths. The first, WHO Application of the International Classification of Disease-10 to Deaths During the Perinatal Period (ICD-PM) proposes a standardized system for classifying stillbirths and neonatal deaths in countries across the globe. The core features of the ICD-PM (ICD-perinatal mortality) are that it identifies perinatal deaths as antepartum, intrapartum or neonatal; it provides a standardized guide while also allowing country adaptability to reflect local priorities; and it links the baby’s death to the contributing maternal condition when applicable. The document aims to promote consistent reporting of stillbirths and neonatal deaths in order to facilitate data interpretation that can ultimately be used to create effective programming for mothers and babies. The second, Making Every Baby Count: Audit and Review of Stillbirths and Neonatal Deaths, provides guidelines for recording and reviewing stillbirths and neonatal deaths. This document aims to address some of the objectives from the Every Newborn Action Plan released in 2014. There are an estimated 2.6 million stillbirths every year, most of which are preventable with high quality care. However, that figure is likely an underestimate given that many countries with poor data collection systems do not count stillbirths. The majority of babies who are stillborn do not receive birth or death certificates, and often the causes of those stillbirths are not recorded or investigated. Reviewing stillbirths, as well as maternal and neonatal deaths more generally, is crucial for creating a better understanding of preventable causes and developing effective treatments. The third, Time to Respond: A Report on the Global Implementation of Maternal Death Surveillance and Response (MDSR), aims to help countries improve their review processes for investigating maternal deaths in order to prevent future errors. A 2015 survey of 64 low- and middle-income countries (LMICs) revealed that while 86% had a national policy to notify all maternal deaths, only 46% had maternal death review (MDR) committees that met at least twice per year. The MDSR proposes a continuous action cycle that includes four components: 1) identify all maternal deaths and notify the family and friends of the woman who died, 2) review all maternal deaths to determine the cause(s), whether or not the death was preventable and make recommendations for action, 3) de-identify, analyze and report data on maternal deaths and produce an action plan, and 4) develop strategies for implementing action plans and monitor progress. Each of these components requires the participation of numerous actors including community members, health facilities, local and national governments and multi-level MDR committees. The ultimate goal of the MDSR system is to increase countries’ accountability for maternal deaths, expand access to accurate data on the prevalence and causes of maternal deaths and design effective interventions to prevent them. The problem remains that many LMICs lack sufficient health information systems to implement these recommendations. 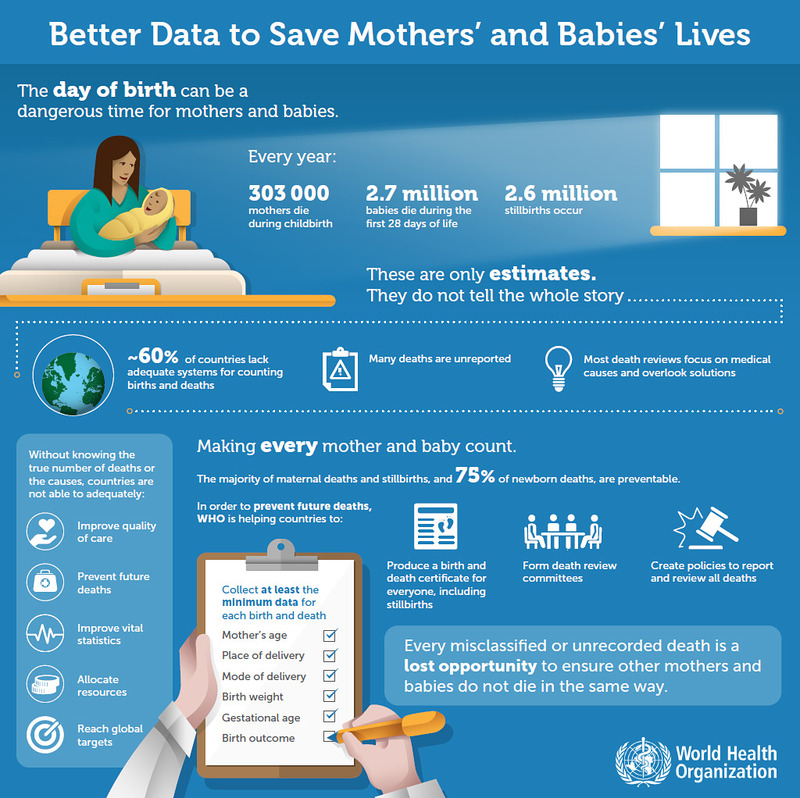 Additional research on the capacity of national and local data systems and strategies to improve them are crucial steps to ensure countries’ ability to measure, review and report maternal and neonatal deaths. Learn about the MHTF’s role in Ending Preventable Maternal Mortality. Read about ending preventable stillbirths in The Lancet.